A tour with the Branson Belle offers guests an encompassing time of live entertainment show, three-course meal, and an opportunity to sightsee spectacular views along Table Rock Lake. This authentic paddle wheeler boat will take a lake cruise for a nostalgic time that will hearken back to the popular entertainment boats that once travelled the Mississippi River. Your travel experience with Branson Belle will begin with an energetic emcee as he shares interesting stories and facts about the performances that you’ll see as you begin to enjoy your meal. Branson Belle offers guests Lunch Cruise which will be available until December 30, 2016. In this Lunch Cruise, you will see the performances of fiddler Dean Church and pianist Julie McClarey team up with female quartet, The Showbelles and the live band Castaways. Comedian Mike Bliss livens up the stage with his fantastic comedy. Branson Belle Dinner Cruise will be available until December 31, 2016. During this Dinner Cruise, you will be able to enjoy a delicious meal while watching the amazing performances of Rhythm (the fastest feet of the Mississippi), Branson’s finest singer Cassandre Faimon-Haygood, and Christopher James, host of The ShowMen. After you have enjoyed the three-course meal on board the Branson Belle, that is prepared fresh right in the ship’s galley, you can get the chance to roam around the boat and stay on the outer decks and enjoy the beautiful sights of Table Rock Lake. Then, you can get back inside to enjoy a rollicking good time of live entertainment show featuring music, dancing, and comedy. The shows perform onboard the Branson Belle are really entertaining and phenomenal and the ship itself is exceptionally amazing, where you can see the pilot-house of the ship and its six-foot wooden, vintage captain’s paddle wheel. The lunch-time cruise is headlined by the brilliant musician Janice Martin. No other musician on earth does what she can do; she plays violin while doing acrobatic acts, she sings like a bird, and skilled on multiple instruments. This multi-talented performer is joined by the delightfully funny ventriloquist, Phil Hughes. To make sure the show will give more fun and excitement, emcee Aaron Radatz will be at your service. Fantastic live entertainment, great food, and beautiful lake, it’s all waiting for you when you take a fascinating lake cruise with ShowboatBranson Belle. Delicious menu servings that you will enjoy onboard the ship include Freshly Baked Yeast Roll with Butter; Fork Tender Pot Roast with Espagnole Sauce & Honey-Dijon Chicken; Garlic Mashed Potatoes; Sugar Snap Peas with Julienne Carrots; Smooth and Tasty Apple Cinnamon Torte; Coffee and Iced Tea; and Vegetartian entrée option: Lasagna Roll-Ups Filled with a Rich and Smooth Blend of Cheese – Baked in a Zesty Tomato & Basil Sauce. 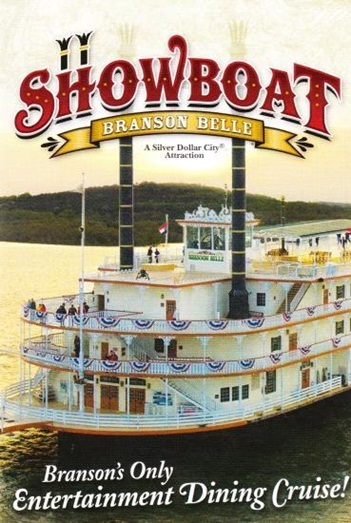 If you want to have a break from the busy city life, take a wonderful lake cruise with the Showboat Branson Belle and enjoy sightseeing along Table Rock Lake with delicious meal and live entertainment show.